When a person is injured in Florida as a result of someone else’s carelessness, he or she is often able to recover damages by filing a personal injury case under the legal theory of negligence. This in turn, requires plaintiffs to prove that the defendant owed them a duty of care, that they violated that duty, and that their breach resulted in an injury. Fortunately, there is an exception to this requirement in certain types of dog bite cases, which can be analyzed under a strict liability framework and so don’t require proof of negligence. These kinds of claims can only be defeated by the raising of very specific defenses, so if you were injured when someone else’s dog bit you, it is important to retain an experienced dog bite attorney who can help you present a solid case. When a claim is filed under the legal theory of strict liability, the plaintiff is not required to prove that a defendant was negligent in order to recover damages. In fact, the negligence of the defendant is irrelevant to the outcome of a case, which instead, is contingent upon proving that the defendant owned the instrumentality that caused the injury. In dog bite cases, this means that plaintiffs are only required to demonstrate that a defendant owned the animal that attacked them in order to recover damages. What are the Defenses to a Strict Liability Dog Bite Claim? A sign with the words “Bad Dog” was displayed at the scene. Defendants can also avoid paying all of the damages if there is evidence that the injured party somehow contributed to the accident, in which case, the recoverable amount of damages will be reduced by the victim’s percentage of fault. 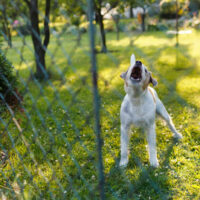 It is also worth noting that Florida’s strict liability statute only applies to dog bites and not to all injuries caused by animals, so if someone was injured after a dog knocked him or her to the ground, that individual would be required to file a standard negligence claim in order to recover damages. Finally, the strict liability law only applies in cases where the victim was on public property or lawfully on private property, so those who were trespassing at the time of their attack will also need to file a negligence-based claim before they can collect compensation for medical bills and lost wages. If you or a loved one were bitten by a dog, please contact Boone & Davis in Fort Lauderdale at 954-566-9919 to learn more about filing a strict liability claim against the at-fault party. A member of our legal team is standing by and eager to assist you with your case.